Being a stay-at-home mom can be very isolating. It’s a great deal of time at home alone with children; there is no way around that. In those long hours your mind tends to wander. Really, how much time can one spend discussing just how fluffy Elmo is? (FYI, he’s “a lot of” fluffy.) Though my general focus is on wiping butts and filling tummies, in the recesses of my mind I am always on the verge creating the next big thing! The adult Diaper Genie: I worked in nursing homes for many years. One can only imagine the general aroma of dozens of adult diapers being changed multiple times a day. They obviously had a system in place that supposedly met hygienic guidelines (in third world countries); however, my adult diaper Genie was going to revolutionize the air quality of nursing homes nationwide. It was going to be the size of a 50 gallon garbage can, allowing for mass amounts of disposal, and the air tight seal would be key in eliminating the smell of pee pee permeating the building. I would be hailed as the woman who brought a breath of fresh air back into the nursing home system. Turns out that Playtex, the makers of the original Diaper Genie had applied for a patent on the very same idea only months before! FOILED! Obviously, if my brain is working at the same level as the geniuses over at Playtex then another idea would be soon to follow. The no-mess cutting board: I have the meat cutting board with a groove around the edge that is supposed to catch the liquids when carving, but it always overflows. My idea was to attach a small plastic container to the corner of the board to catch the liquid as it ran off. I was ready to take it one step further and configure the container in a way that would separate the fat from the natural juices for later use. I wouldn’t stop there; the container would be sealable allowing for easy storage in the fridge!! Answer: Yes, the “bladder”, as I had dubbed it, would hang off the side of the counter or over the sink… convenient, right? Answer: Yes, it does, and it’s on Amazon probably making the inventor millions!! 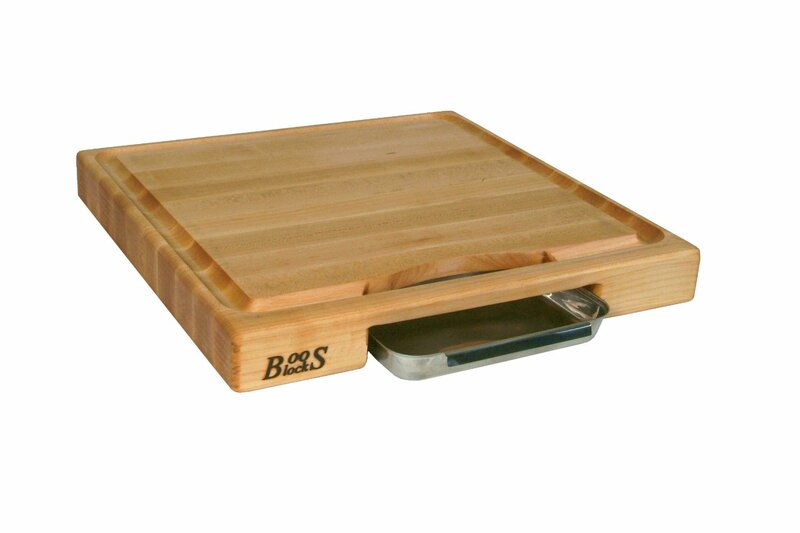 The no mess cutting board, only better. Individually wrapped hot dogs: We very rarely finish a package of hot dogs. Often, half empty packages can be found wedged in the back of the refrigerator coated in a grayish pasty layer of funk and begging to be thrown away. Why not just individually wrap them, like string cheese, I brilliantly surmised!? This way I could take out two while the rest of the dogs would remain sealed and fresh. My dad makes his living marketing and creating packaging for food products so I called him immediately thinking I was gifting him with THE next big concept in food packaging. He suggested I start keeping the hot dogs in the freezer. The Ensure chewable: I have made no secret of how skinny Man is; I would do anything to get more calories into him. I go so far as to make him something we have dubbed “apple fluff” which is neither apple nor fluffy (the origin of the name is a story for another day). It’s a delicious mix of baby oatmeal flakes, a tablespoon of peanut butter and a chocolate Ensure shake. It’s the most caloric thing I can create that he will allow past his lips and a way to guarantee that he has at least some of the shake. You see, he, unlike most other kids, is not so fond of Ensure, it would be so much easier if I could just feed it to him in one or two bite sized chewable tablet. But alas, how could I fit all of that fat, sugar, and carbohydrates into a few small chewy bites…? Oh right, it’s called Snickers. The bonus card app (a particular fave): How many of you are plagued with carrying around dozens of those annoying plastic bonus cards?? How nice would it be to have one app with all of your bonus cards?? Now, I have no idea how technology works; I’m not even sure how I’m working this computer right now, but however it can be done it sounds like a real winner to me! I was told that though this sounded like a fabulous idea, I would be absolutely unable to pull it off. Guess what, a few months ago I read that someone did pull it off. Turns out it’s called “Keyring” and it was voted first place in Mobile Commerce and Best Online Pick for the 2011 Cellular Telecommunications Industry Association (CTIA) Emerging Technology Awards… See, I knew it was genius. I recall one summer in camp trying to get them to silkscreen a new “Coed Naked” t-shirt: “Coed Naked debate team, debaters do it orally.” But I was 13 and they thought it was slightly inappropriate. I guess all of my life I’ve been on the cusp of greatness, only to be held back by those around me that are more rational and grounded. So here I sit, not a millionaire, alone on my couch while the kids nap watching Beverly Hills, 90210 (the Brenda years) just waiting for my next idea. A portable entertainment system for mommy while the kids are asleep, mayhaps? Crap, I’m on mine right now. Get ManVsMommy in your inbox! ADHD: I LOVE Him, But His Poor Impulse Control is Killing Me.